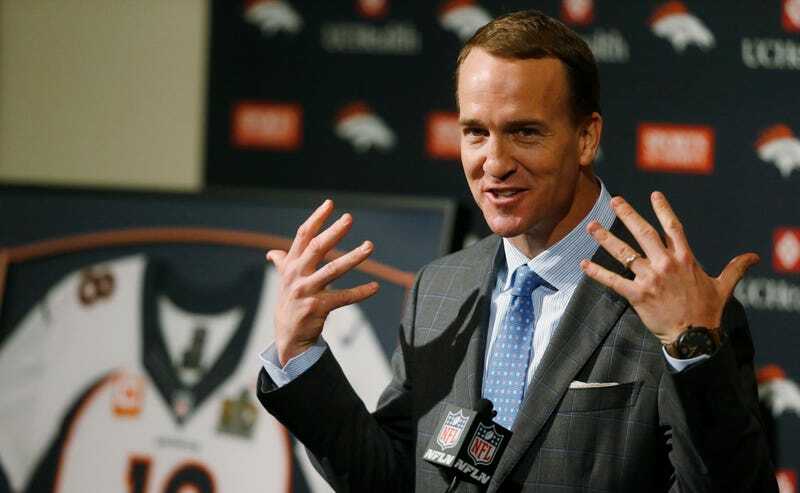 Peyton Manning was all smiles and tears at his retirement press conference, at least until he was finally asked the question that everyone seemed to be waiting for. Toward the end of the presser, USA Today’s Lindsay Jones brought up the recently resurfaced allegations made by a former Tennessee athletic trainer during Manning’s college days. The ESPN feed cut off midway through Manning’s answer. HMMMMMM. It aired on NFL Network, though. A fine mini-conspiracy theory, thwarted. There’s nothing wrong with asking that question, not when just about everyone went into that press conference wondering if it would be asked. (Honestly, it would have felt weirder if it hadn’t been brought up. The lack of a question about the HGH allegations was glaring.) It’s not a reporter’s job to maintain a festive atmosphere at a press conference, or to ignore a big story, just because some morons think it’s poor timing. The timing was perfect, I think: retirement is about taking stock of legacies, and Manning’s legacy has of late turned out to be complicated. The question couldn’t have been more appropriate.